I strongly supported new legislation in the Parliament which will require children to be age-appropriately vaccinated before they can be enrolled in a pre-school or childcare centre. Sadly, there are still some parents who object to vaccinations in spite of the mountain of evidence that vaccinations not only work, but have saved countless millions of lives. Mr GREG PIPER ( Lake Macquarie ) ( 11:09 ): I contribute to the debate on the Public Health Amendment (Review) Bill 2017. I support the vast majority of the measures in the bill. Anything I say that might be taken to be contrary should not be taken as an indication that I am not concerned. I hope the Minister for Health is having a break. I saw him down here earlier and I know he is quite ill at the moment. This bill deals with a number of public health issues and it is not my intention to deal with all of them individually, as I believe the Minister and the shadow Minister have comprehensively outlined those matters and their objectives earlier in the second reading debate. I will comment briefly on several aspects of the bill that have generated a lot of correspondence to my electorate office and have sparked new debate in some familiar quarters. Most importantly, this bill introduces measures that will mean a childcare centre will only be able to enrol a child who has been age-appropriately vaccinated. The Minister has outlined several exemptions to that rule, including allowances for children on an approved catch-up schedule, children who have properly identified contra-indicated medical conditions to vaccination, and allowances for children of Aboriginal or Torres Strait Islander descent, who have more difficulty in producing vaccination records. I fully support the Minister's intention in this regard and I applaud him for bringing the substantive part of the bill before the House. I do not accept the views of those parents who conscientiously object to vaccinations in the face of a mountain of evidence and modern science, and who are swayed by the somewhat peripheral arguments peddled by the anti-vaccination lobby, which chooses to ignore so many facts. Sadly, perhaps we will never change the minds of those objectors, but what we can do is try to keep them properly informed of the facts and, more importantly, protect the vast majority of children and parents who do the right and responsible thing, and, of course, those parents' children. The science on vaccination is in. It is not a perfect science and is one that will continue to evolve. It is not a one-size-fits-all solution, but vaccination clearly unequivocally works. It saves millions of lives, it protects our communities, and any side effects are almost zero when weighed against the global benefits. The World Health Organization estimates that immunisation prevents up to three million deaths every year and is one of the most successful and cost-effective forms of public health intervention. For those living in the developed world, vaccination has so successfully contained once-rampant diseases such as smallpox, measles, polio, tuberculosis, whooping cough and hepatitis A and B that people can easily forget what a scourge these health problems once were. Smallpox, a disease which has been eradicated worldwide thanks to vaccination, killed an estimated 350 million people in the twentieth century alone. 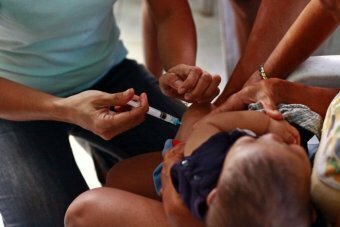 Measles is now a relatively rare childhood disease in Australia but it remains a leading cause of death globally among children aged under five. In the late nineteenth century, tuberculosis was the leading cause of death in Australia. It was 20 times deadlier per capita than all the cancer conditions combined today. Today, tuberculosis is virtually non-existent in Australia, but sadly we do not have to look far to see the impact it is still having in communities that do not have universal access to vaccination. In Papua New Guinea, 14,000 new cases of tuberculosis caused almost 3,000 deaths in 2010, although that annual figure is now falling thanks to greater levels of vaccination. There are many other statistics I could use to illustrate the tragic incidence in the developing world of high mortality rates from vaccine-preventable diseases, but most people are aware of them. In my time working as a nurse at Morisset Hospital, I cared for a number of people who had suffered severe developmental disability from the infectious and now preventable disease rubella. I also cared for people who had suffered from and carried lifelong debilitation from tuberculosis. I am old enough to have known people who bore the physical effects of polio. Their limps or constant need for leg braces and crutches were the lifelong legacy of a now preventable disease. Since the World Health Organization committed in 1988 to eradicating polio throughout the world, the annual incidence of cases has fallen from 350,000 to several hundred. Polio currently exists in just six countries, which all have isolated cases or outbreaks. Those statistics serve to remind us why we should remain vigilant to the potential dangers of infectious diseases that are now, thankfully, little more than bad memories. I saw in Martin Place yesterday the protests from some of these conscientious objectors and anti-vaxxers who say that the Parliament does not have the right to remove their freedom of choice, compel them to participate in a public health program they disagree with, or discriminate against their child's right to early education. This bill does not do any of that. What it does do is protect the health and wellbeing of our entire community, in particular children, who should not be exposed to unnecessary and preventable health risks. I cannot sit by, and I do not think any government should sit by, and allow the health of millions of people to be put at risk by others. All children who can be vaccinated should be vaccinated for their protection as well as that of others. An area I do have some concern with is the amendment to section 79 of the Public Health Act, which pertains to the requirements and obligations on people with a sexually transmitted infection. The Minister and the Government are generally finding the right balance between the rights and responsibilities of an individual and those of others, but I agree with some of the leading sexual health agencies when they say the penalties appear significantly disproportionate to the crime. Imposing an $11,000 fine, a six-month jail term, or both on one party who fails to disclose a notifiable sexually transmitted infection [STI] is not reasonable. In this day and age, all people should know of their risks and responsibilities during somewhat romantic or sexual encounters, however random or regular they may be. Although I question the proportionality of the measure, a more important consideration could be that legislating such punitive measures will undo so much good that has been done to encourage people to be aware of their sexual health and to seek appropriate health care when they suspect they may have been infected. This is a regressive step that I cannot support. There have been cases of the wilful transmission of an STI where, in effect, that infection has been weaponised for a malicious purpose. However, such actions are covered by criminal law and are considered to be inflicting grievous bodily harm. Notwithstanding that issue, other amendments contained in this bill offer significant improvements to public health. I specifically note the provisions relating to environmental health, which should further reduce the risk to public health posed by pools or public splash parks, and to section 25 of the Act, which relates to the provision of drinking water. With the exception of those matters around section 79, I thank the Minister and his staff for these amendments, which I believe will result in a significant positive impact on public health. Although I have expressed concern about section 79, I understand there may be some consideration of this in the other place. I cannot be sure whether that will lead to amendments, but I certainly hope that will be addressed. Notwithstanding that particular consideration, I will be supporting the bill in this place.